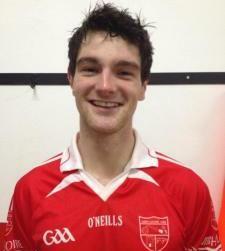 Centre-back and newly formed midfielder, Cal McCarthy is a dentistry student. He made his Championship debut against Ballincollig in 2011. Cal's favourite food is a Lennox's breast-in-a-bun. His favourite TV show is Modern Family while his favourite pastime is taking selfies. Cal also enjoys hurling, swimming and jumping. He considers his greatest sporting achievement to be captaining the Under 13 team to win the Mid Cork against Donoughmore. His best club memories are going to Havanas after training with the GNL(Gortnalour) gang & Tim Pat whipping off his t-shirt and swinging it around his head after winning the Under 21 County Final. Cal considers Shane Galvin to be among the best club players he has ever seen. If Cal could change one thing in GAA - it would be to introduce cheerleaders. When he was younger, he wanted to be a vet. The person he'd most like to meet is Daniel O'Riordan's mystery woman, while he considers the best invention ever to be Diatech instruments for performing a composite restoration filling. Marooned on a desert island, Cal could not be without water, food, a house, electricity, wi-fi, Snapchat, Tinder, all his family, all his neighbours and his banana-hammock(He's not too fussy). You may not know this but Cal is secretly good at pulling....teeth.